Here's the latest addition to the Elite Line: The Godwin. Blade Width at Guard: 2 1/16"
Blade Thickness at Guard: 0.23"
Point of Balance: 2 3/4"
Point of Harmonics (Blade Node): 21 1/4"
For inspiration I was thinking of the XVIa.5 from Oakeshott's ROMS, which is of course a type XVIa and I classify this as a type XVIIIa due to the sharp profile taper and 1/3 length fuller. For me at least the classification is a little fuzzy between these two types so I suppose it could fall under either category. Since you gave us the blade thickness at the guard, could you also give us 2 more thickness measurements - at blade midpoint, and maybe an inch or so up from the point? This would give us some notion of what the distal taper is like. Also, I was looking at your website, and am a little confused (that happens often to me) Some of your products are listed as "Handmade Windlass Sword" or "Handmade Hanwei Sword" - obviously products form those companies. 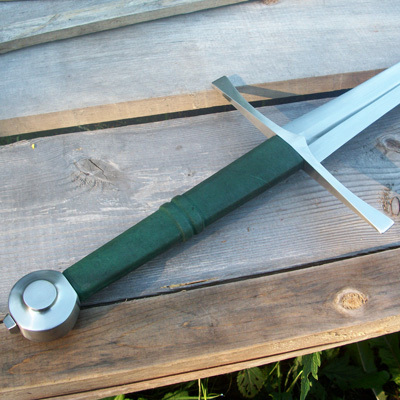 Do you take, say a Windlass sword and then modify and improve it? Do you attend the Minnesota Ren in Shakopee, by any chance? If so, I will have to check your stuff out when I go this year. Lovely piece of work Ben. The proportions are nice on the eye. Really look forward to the Irish ringhilt you're making me. That...seems to have some very nice lines! 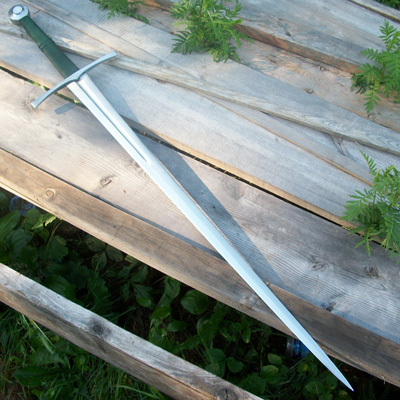 Roger: At 17" from the guard, the blade thickness measures 0.178" and at 1" from the point it is 0.095". I re-measured the thickness at the guard and it is 0.23" thick. I was in a rush when I initially measured it. With regards to the Hanwei and Windlass products I offer them as they come from the factory but I have performed many upgrades on their base-line products over the years. 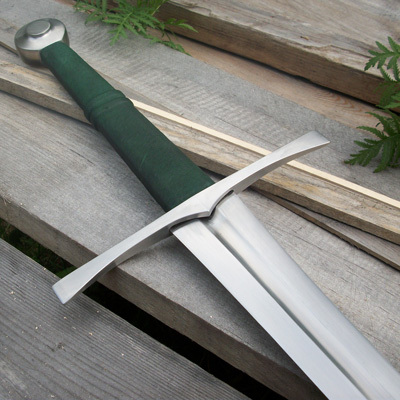 For my lower priced swords I actually use the Hanwei/Tinker blades as a base and further refine the edge geometry and polish them and then the hilts are made entirely by me. It helps me to provide different price tiers, and give my body a break; I used to hand forge every blade in my normal line-up. 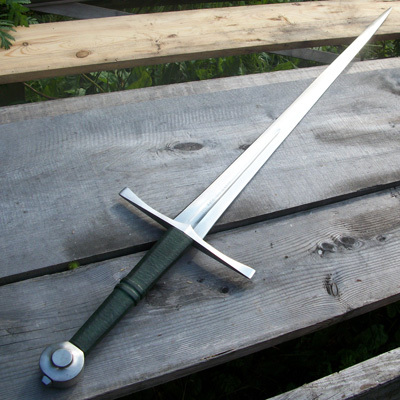 Now the Elite Line, such as the Godwin Longsword here, are entirely hand forged by me personally. I am willing to modify and upgrade virtually any Hanwei or Windlass product, but its a service I haven't widely publicized yet (not sure why not to be honest...). Scott: I haven't been to the Renny for a number of years now and even then it was only as one of the public. The costs to have a spot at the renfest are so sky-high last I checked that I have no current plans to attend. However, if you ever get up north a bit further, I do attend the White Oak Rendezvous & History Festival as well as the Medieval Fall Camp in Deer River, MN. The rendezvous is coming up on the 3-5 of August and the Medieval Camp is on October 19-21 if you are interested. An elegant looking sword with some nice lines. Very nice work Benjamin. Thank you for the kind words Brian. 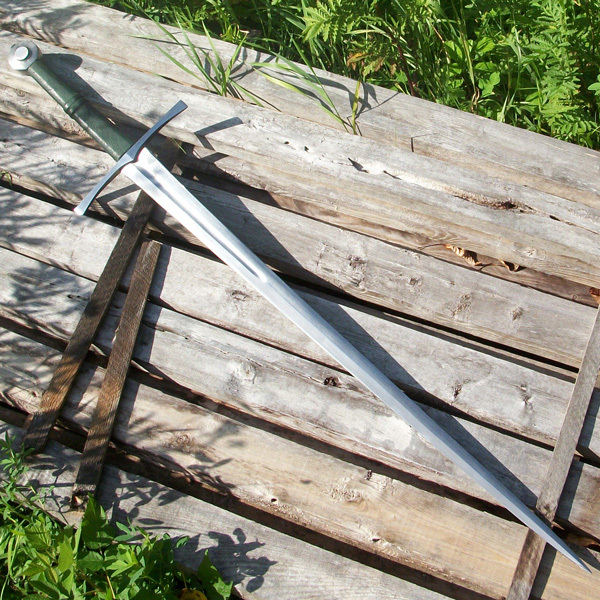 My goal with this sword was to create something appropriate for a 15th century English archer in the employ of the Burgundians or at Bosworth or Stoke. 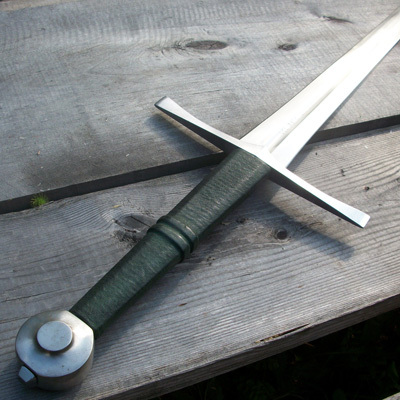 One of the common remarks from contemporary chroniclers is that in contrast to many continental European soldiers, the English tended to favor long swords. I am president of a historical society up here in northern Minnesota and one of my personas is a late 15th century English mercenary named William Godwin. 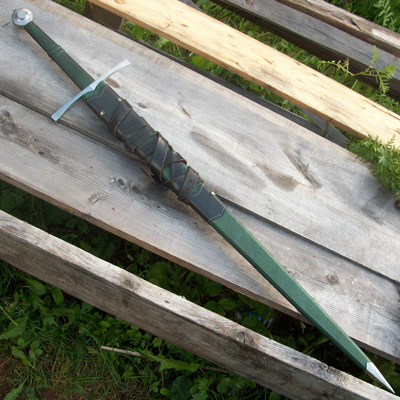 I thought this type of sword would be an appropriate side-arm for such a man and named it accordingly. Without handling the sword, I must say that it appears to be as good as it gets. An absolute beauty appropriately named. It's also nice to know that this is available upon demand and wasn't a one off. BTW, what does the scabbard look like? Be careful, you'll get more orders than you'll know what to do with. I handled this sword over the weekend at White Oak and the instant I picked it up any bystander would have seen my face light up. It is really a joy to handle and the fit and finish are superb. This is simply excellent work. Jon, Scott, I appreciate your fine words guys. 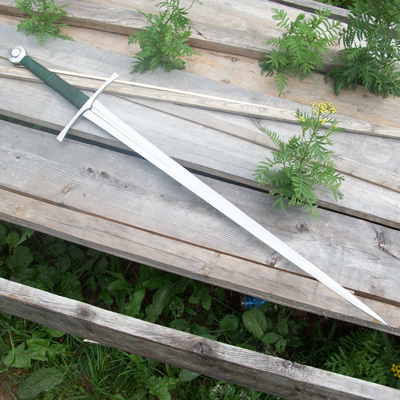 I'll try to get some scabbard pics up soon. I wanted this piece to feel ready for action, quick and nimble. Here's a few more pics including one of the (almost) finished scabbard. Just sent this one off to its new owner with blued fittings (which isn't showing up very well in this pic). 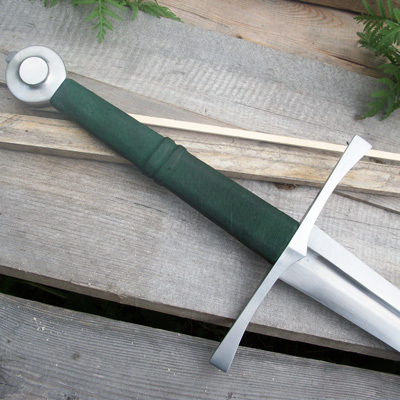 Number two Godwin Longsword is away. The first one? I'm keeping it, muhahahahahahaha!!! !